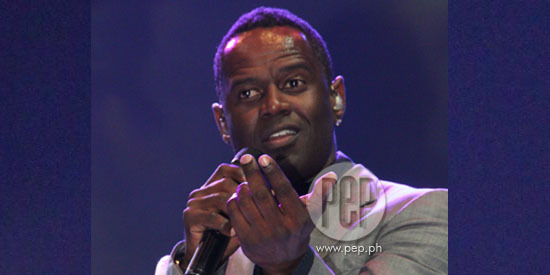 Brian McKnight staged a one-night concert at the Smart-Araneta Coliseum last Friday, March 16. If you were free last Friday night, March 16, and happened to have some money to burn, it wouldn’t have been impossible for you to consider catching Brian McKnight live at Smart-Araneta Coliseum. After all, you might be one of the many romantics who melted over his hits like "Back At One," "One Last Cry," and "Marry Your Daughter." It was great seeing homegrown artists like Kyla and Sitti supporting McKnight. Other celebrities were seen in the crowd as well: Robi Domingo (who was covering the concert for ASAP Live), Vice Ganda, Jhong Hilario, stylist Liz Uy, blogger Laureen Uy, LJ Moreno, and Wendell Ramos, among others. Opening the show was Angeline Quinto who aced her rendition of Celine Dion’s "My Heart Will Go On" and Lani Misalucha’s "Bukas Na Lang Kita Mamahalin." It’s worth noting that she channels a very young Regine Velasquez, both with her allure and her flair for belting out high notes. After a short break, the crowd roared at the sight of McKnight, who sported a gray suit for the concert. He opened with "Shoulda Been Lovin’ You," with his signature melismatic style of singing. It was followed by "Gimme Yo’ Love," a track from his "Just Me" album released in 2011. Keeping the momentum of a soulful vibe for the night, he went on with a slow version of "All Night Long" and "The Only One For Me." McKnight proved himself not only as a musician but as a ladies’ man as well by dedicating "Another You" to all women who went solo that night, indulging in his distinct style of singing that other artists try so hard to emulate. All throughout, he danced to his upbeat songs. For those who may not be too familiar with his other songs, he kept them entertained with his antics, like intentionally stumbling as he sings, saying "excuse me for... stumbling." Or doing a gangsta pose after a song or playing along with his Spanish guitar. Apparently, it was his humor, charm, and voice that kept people on their toes while waiting for the next set. The show took an informal yet endearing turn as he displayed his talent for playing the keyboards while sharing some details about his life—both in terms of his career in music and personal life. He opened with the fact that he was the assigned piano player back at home, and that, believe it or not, there’s someone in his family who sings greater than he does. Songs like "On The Wings of Love" and "Open Arms" (the first song he slow-danced to) marked his childhood, while referring to hits such as "Overjoyed" by Stevie Wonder and "Rock With You" by Michael Jackson as the kind of music that influenced him over the years. He recalled that the first duet he had when he was starting out was "Love Is" with Vanessa Williams and, while playing the first few keys, called back Angeline Quinto onstage to sing with him. Another notable duet that he had was with Kyla, for their version of "How Do You Keep The Music Playing." What really highlighted the night was McKnight’s performance with his sons Niko and Brian Jr. of "6 Months, 8 Days, 12 Hours." The real treat was watching his eldest, Brian Jr., impressively croon "Marry Your Daughter," a song Brian wrote himself, with Brian Jr. boasting an unmatched talent he clearly got from his father. Looking at his sons, Brian later commented, "I guess I did alright." He ended the night with his classic "One Last Cry." Having McKnight sing to you up close makes you want to ask for more, but such privilege only comes every so often. Good thing, there’s always the videoke we Filipinos can rely upon whenever we feel like singing "One, you’re like a dream come true..."
Catch more of Brian McKnight with his latest album "Just Me," which includes his new compositions as well as live performances.